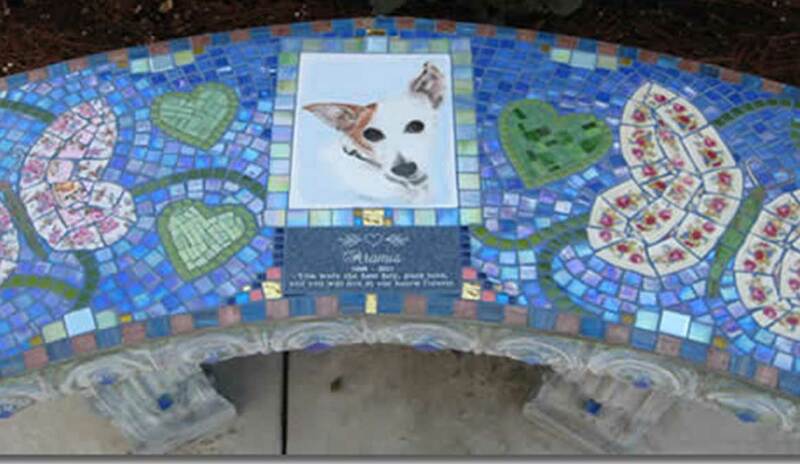 The Mosaic Memorial Portrait Tile benches have a photo of the loved one inset into the design creating a perfect way to memorialize your loved one, pet or special place. 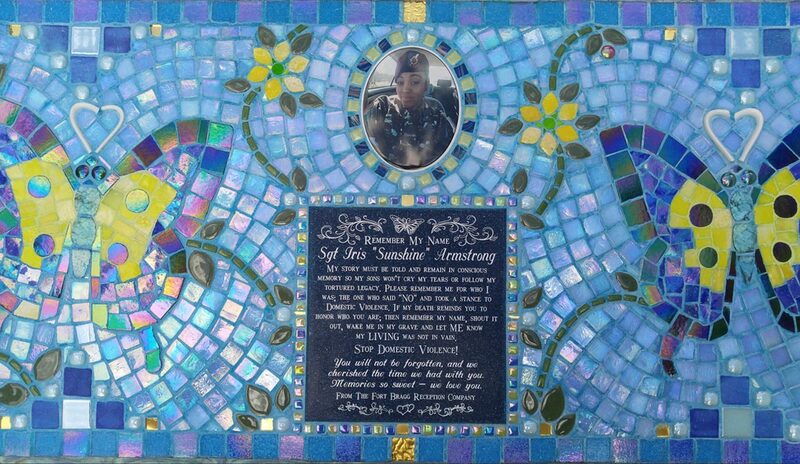 Blue or Green faux stone plaques may be incorporated and begin at $75 depending on size, material and design. 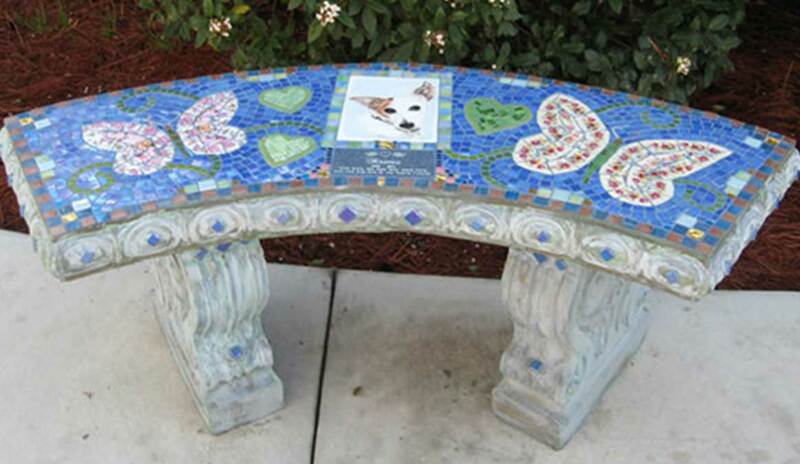 Final pricing depends upon portrait tile size and shape and bench design. 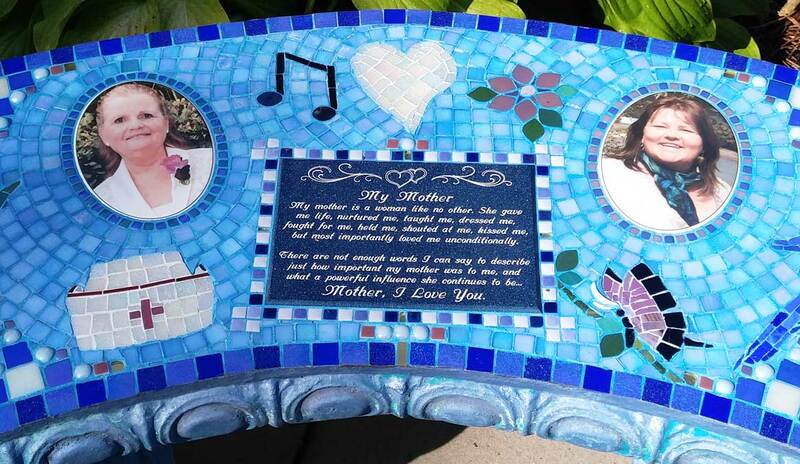 "I am overwhelmed with the love and attention you put into each mosaic stone you so lovingly placed on his bench." 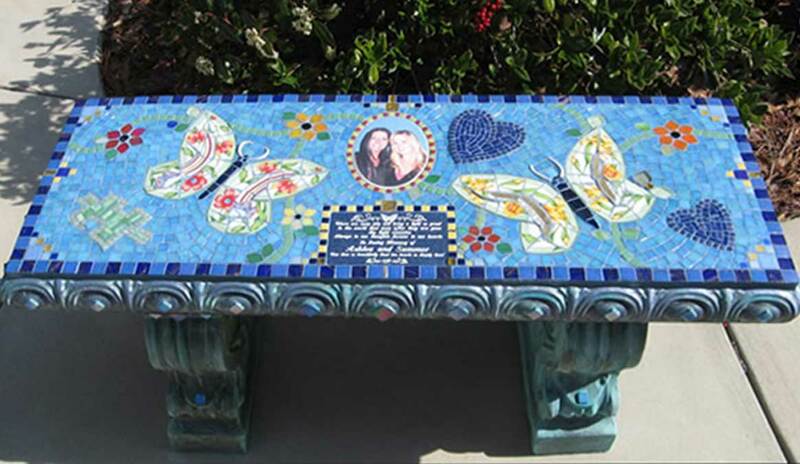 35 inch patina blue mosaic memorial memory bench with medium blue background tiles. 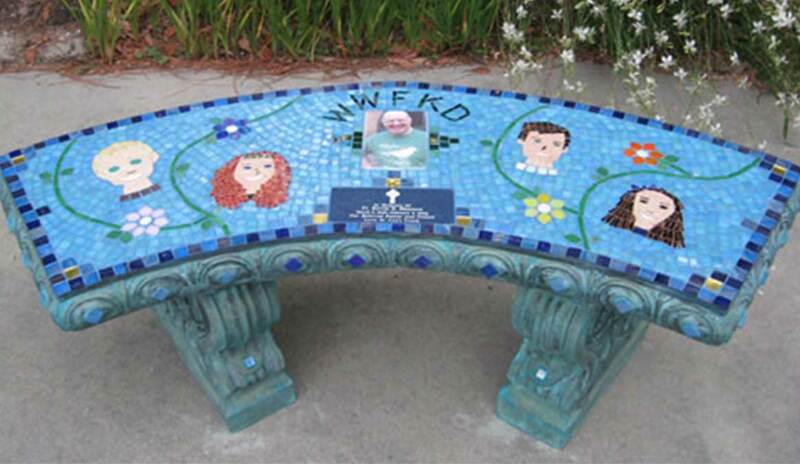 40 inch, patina blue mosaic memorial bench with medium blue background tiles. "It is beautiful and perfect for Iris." 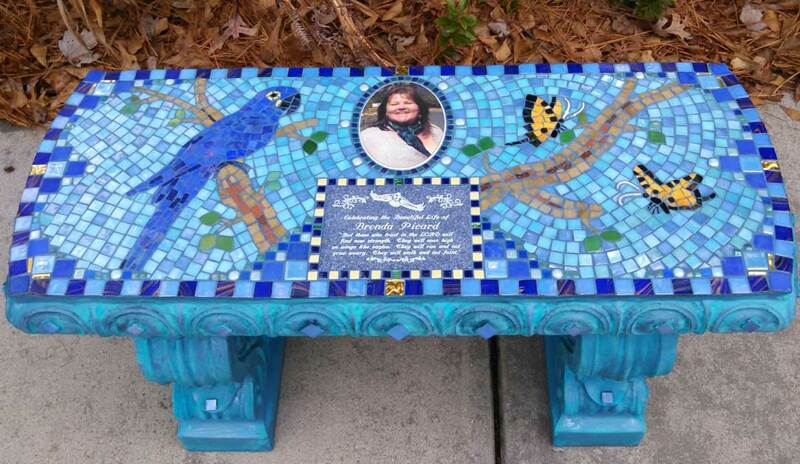 45 inch curved, patina blue mosaic memorial bench with light blue tile background. "Your amazing work speaks for itself. This bench will be something that will fill a void in our home. It's been such a pleasure being able to work with you in creating this timeless work of art." 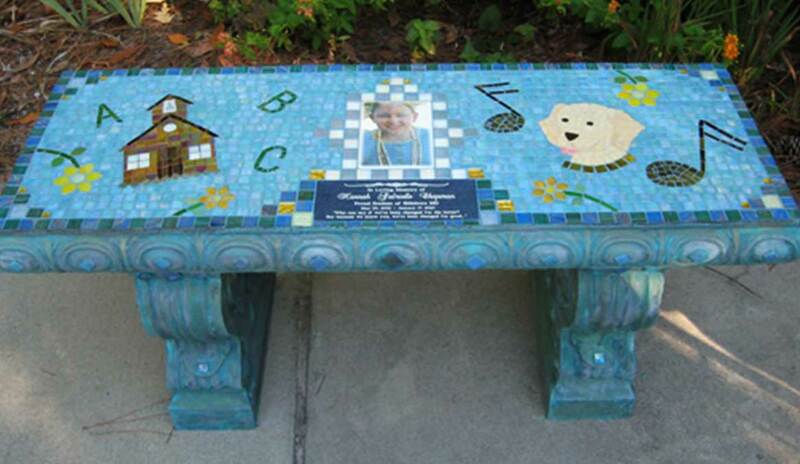 40 inch mosaic memorial bench, patina blue, light blue background. "Wow!!! That's all I got.....just wow!!!!!! So beautiful.....love all the details. You are an amazing talent, Linda." 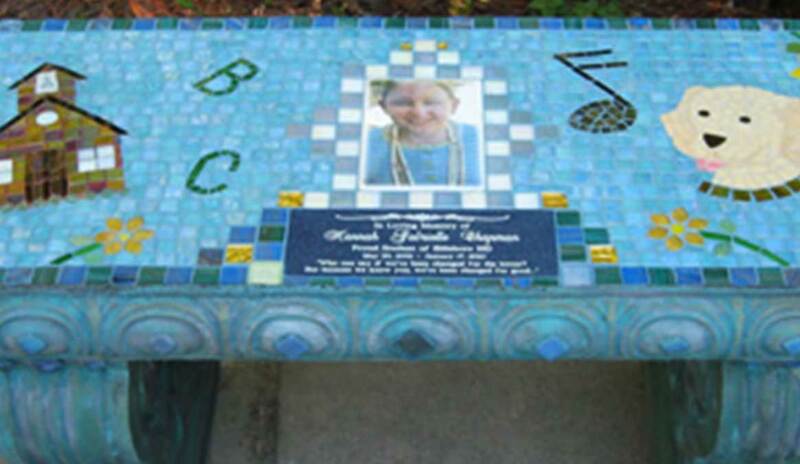 35 inch, patina blue, medium blue background mosaic memorial portrait bench. 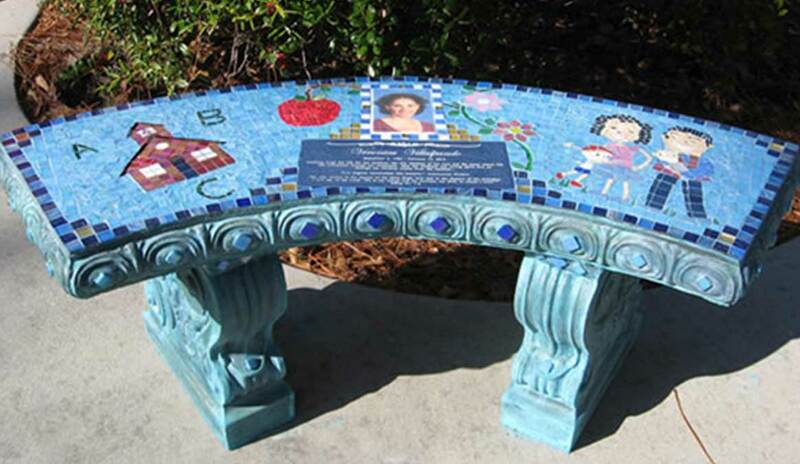 "Bella’s Bench is absolutely beautiful"
35 inch patina blue memorial bench. "You have helped us fill the void we have been missing." "Wow! It’s magnificent. Words cannot adequately express my delight. I’m so happy I found you. I don’t think anyone could have captured our vision quite like you. It brought tears to my father’s eyes." 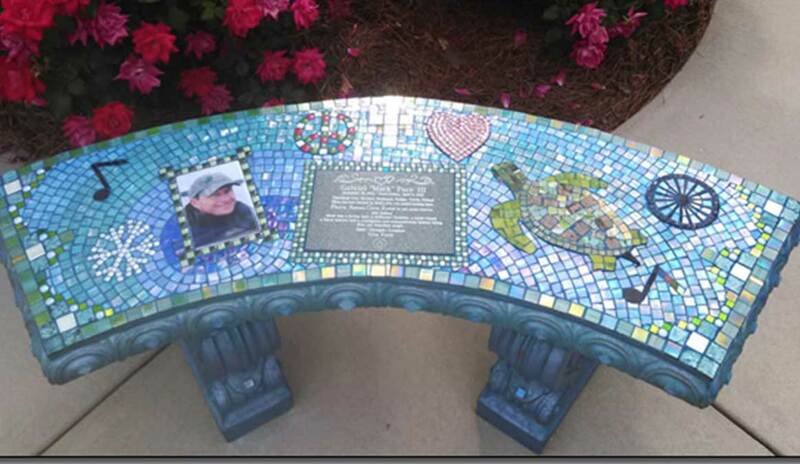 45 inch curved mosaic memorial art bench. 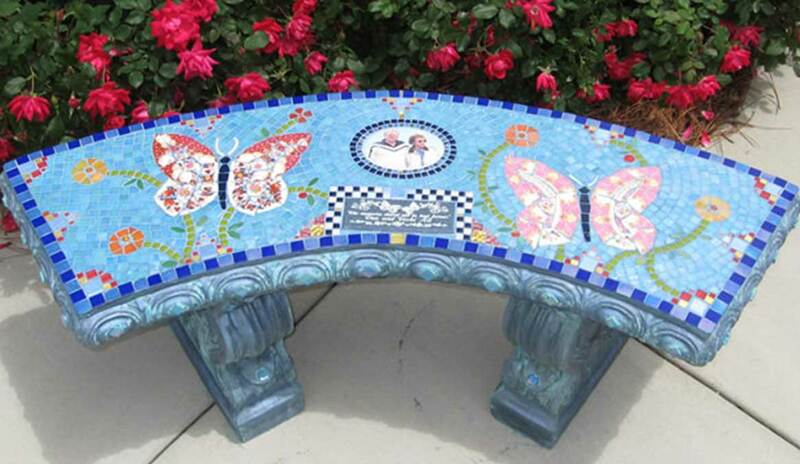 "The bench arrived and it is absolutely beautiful and exquisite. It is obvious you took time and great skill to make my vision into a work of art. I thoroughly enjoyed this artistic process with you. 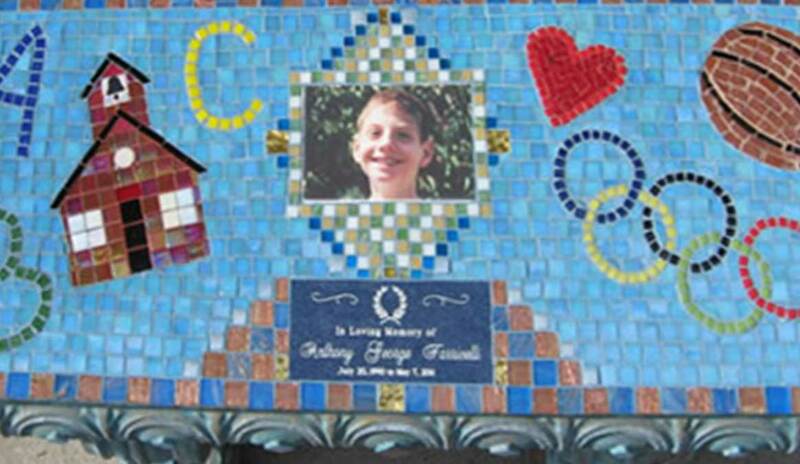 Your care, attention to detail and kindness shines through this mosaic. 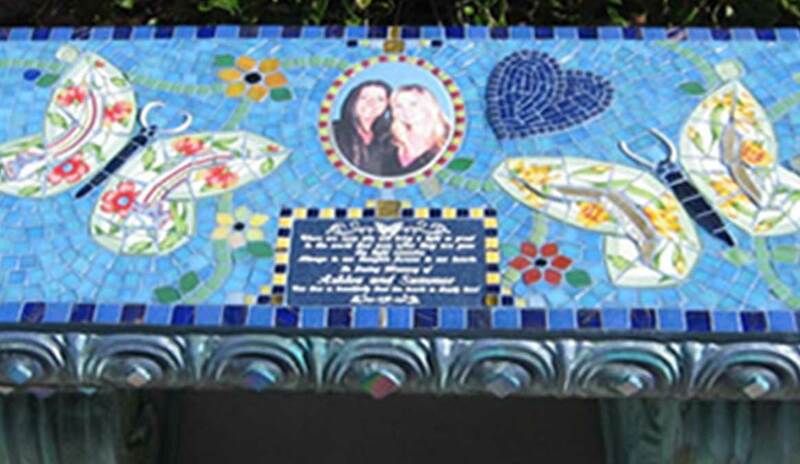 I cannot wait to unveil Mark’s Memorial Bench to my family." 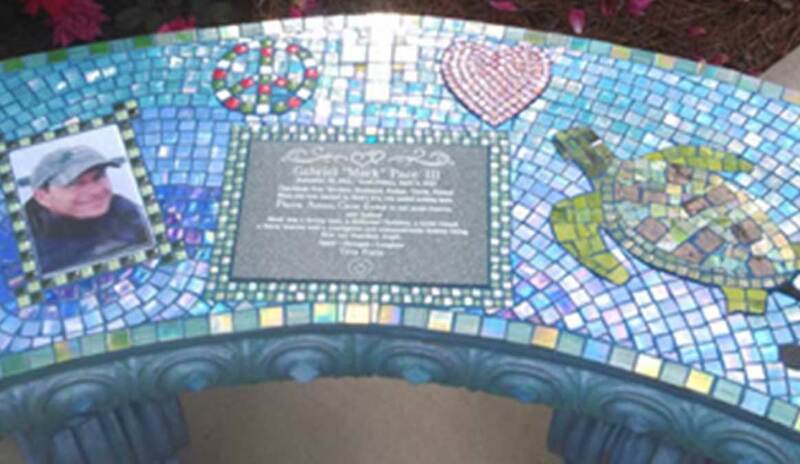 40 inch mosaic memorial art bench. "Thanks…it looks great! Thank you so much! I love the personal aspect of your work. 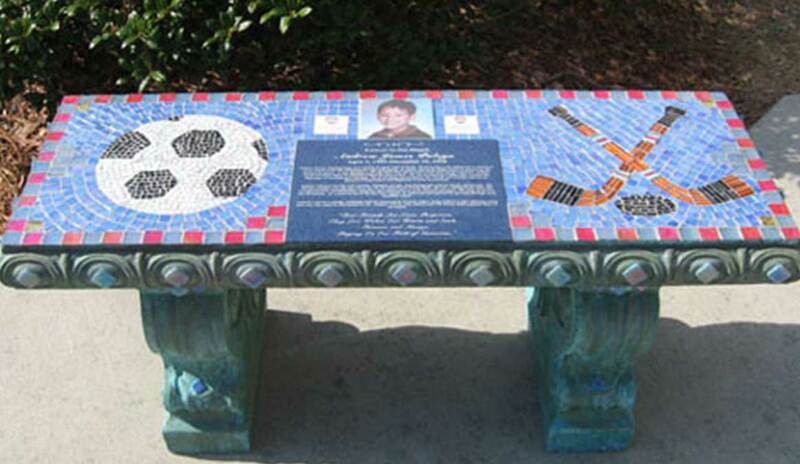 So much more personal than a plain old bench." 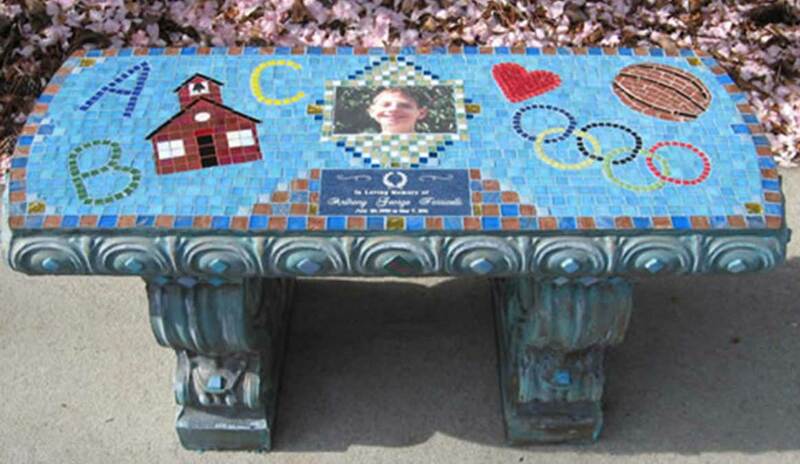 40 inch mosaic memorial memory bench, with blue patina. "Thank you again for all the love that you put into this for us – you have truly helped our hearts so much. 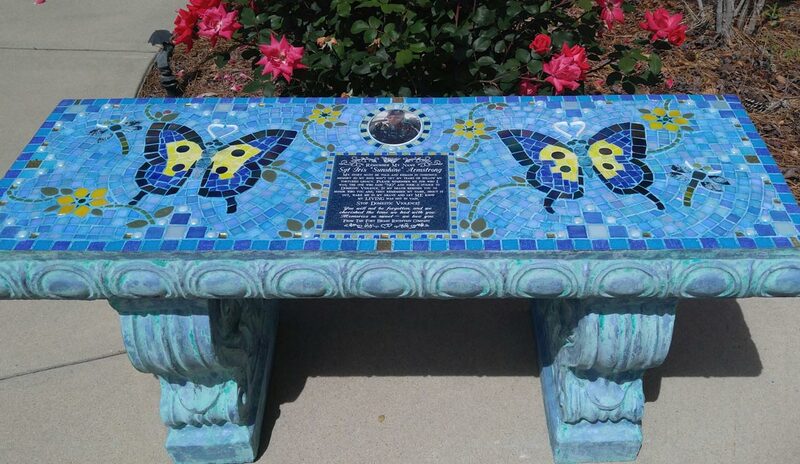 Thanks to you my parents and nephew have a beautiful place to sit when they visit the cemetery." 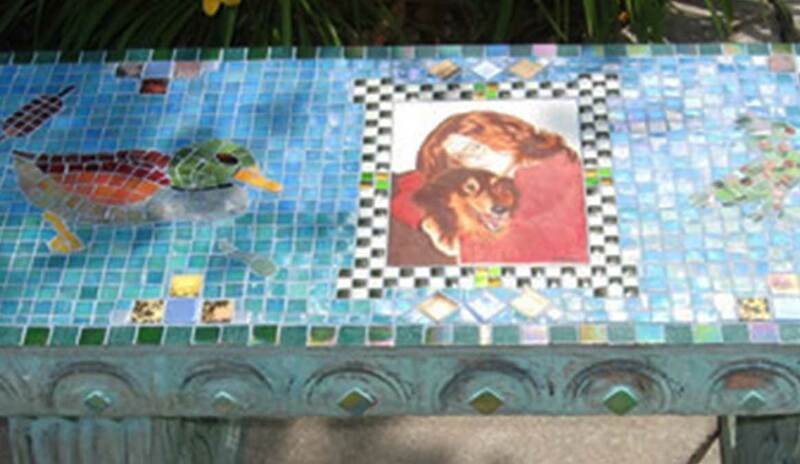 40 inch mosaic memorial bench in patina green. "I love the lake bench. 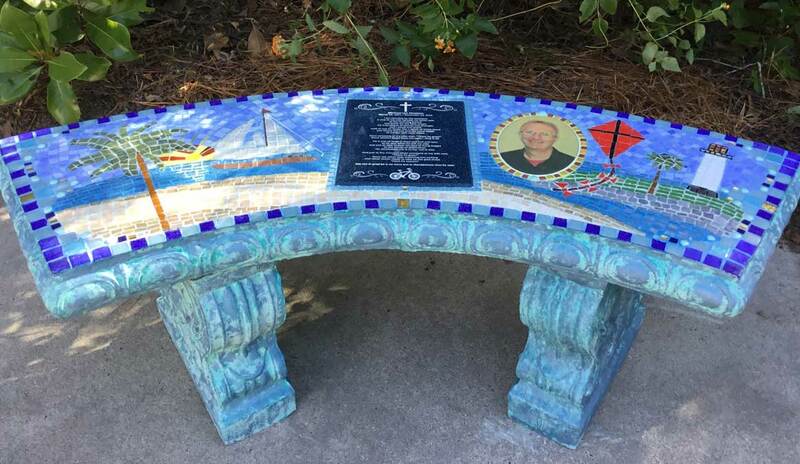 I don’t think I could choose if I was asked which of the two benches I like best.The first bench is perfect for its setting and the lake bench is perfect for the lake. 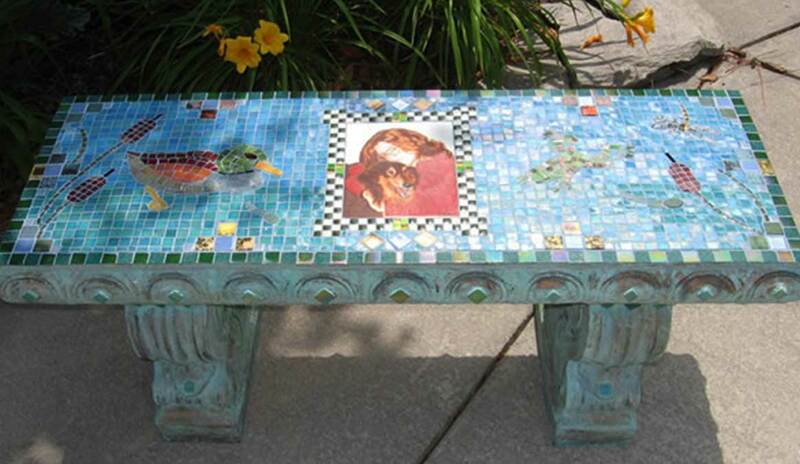 Mom and Dad love the lake bench too. They were excited to show it to me when I arrived at the lake house." 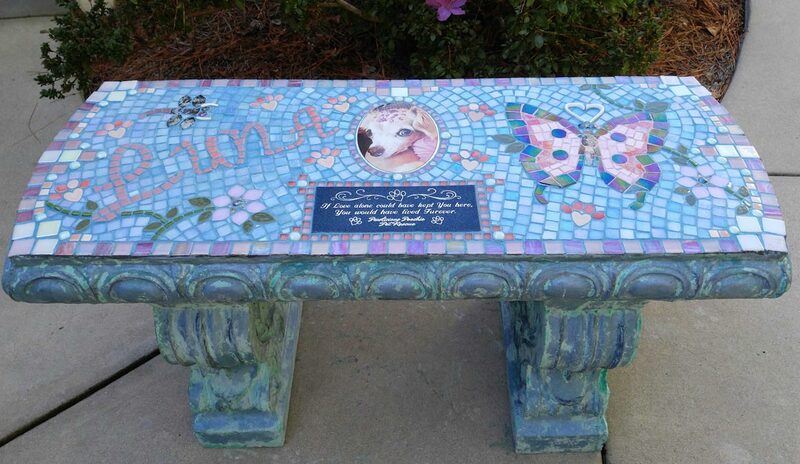 35 inch patina blue mosaic memorial art bench. 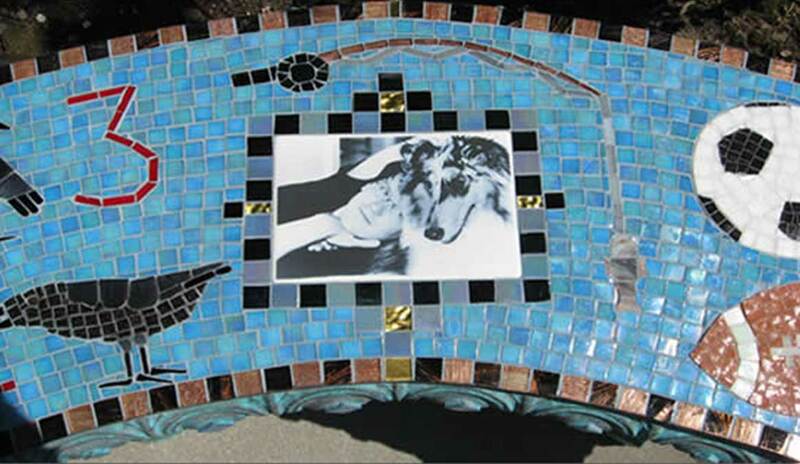 45 inch patina blue mosaic memorial art bench with hand painted porcelain tile portrait. 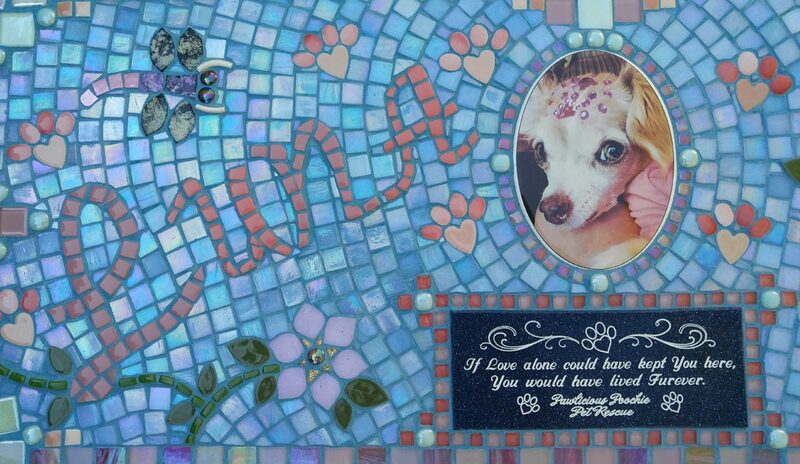 "Thank you so much for creating such a beautiful work of art to memorialize my sweet, beloved Aramis. You are amazing." 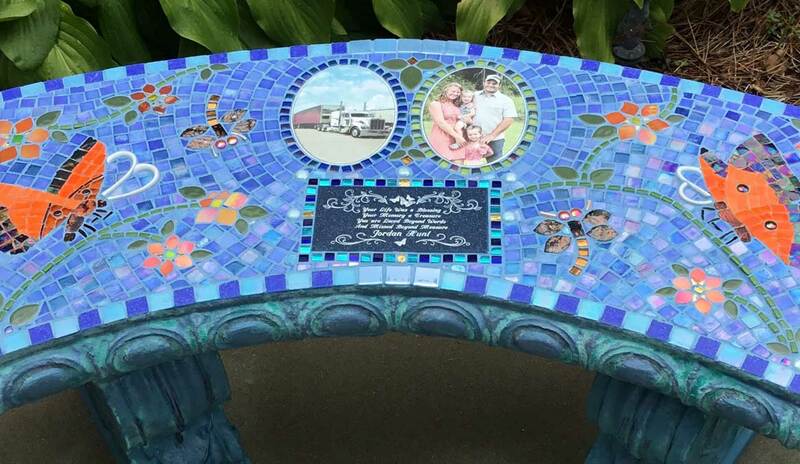 45 inch curved mosaic memorial bench in patina blue. 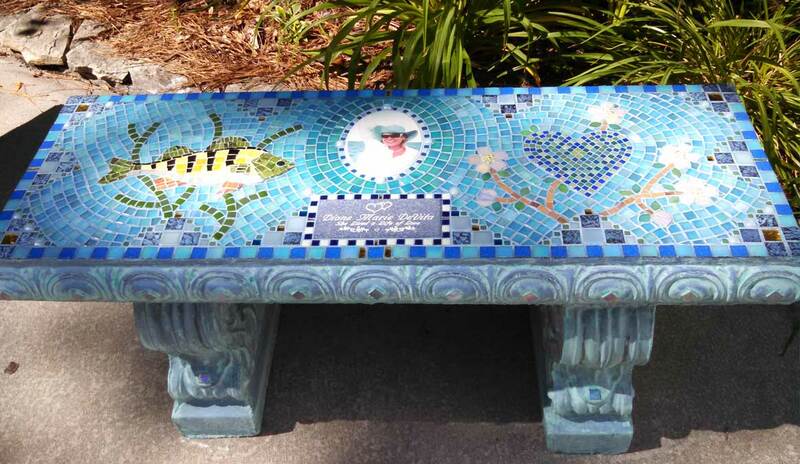 "The bench is perfect — even better than I had hoped it would be." "Thank you for all of your amazing work! 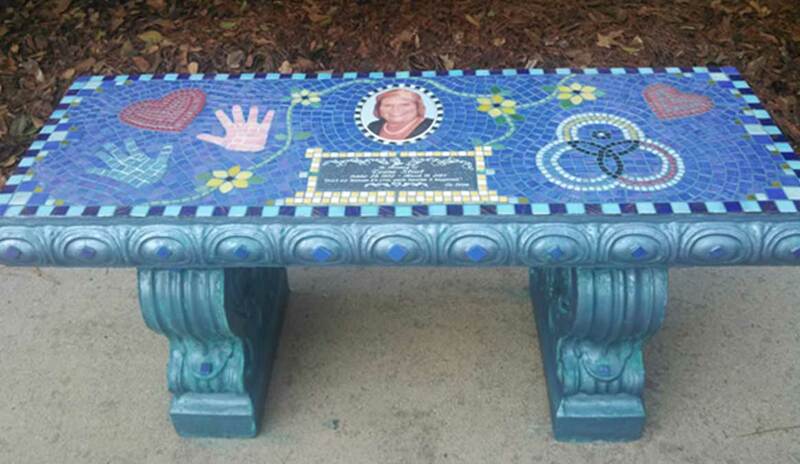 I couldn’t be more pleased the way the bench turned out. You have an incredible gift." 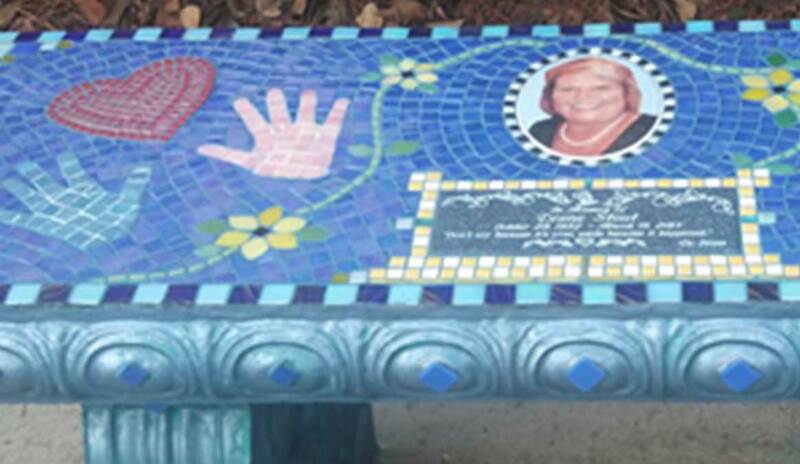 "The bench arrived today, and I was both nervous and excited to see it. It brought tears to my eyes! Linda, it looks even MORE amazing then I could have ever imagined it would be! Your attention to detail is impeccable. 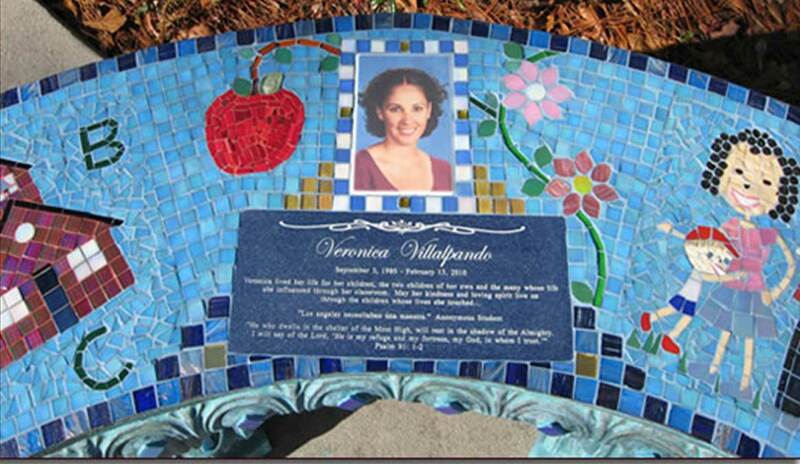 Thank you so much for having made Veronica’s Memorial this awe-inspiring tribute. 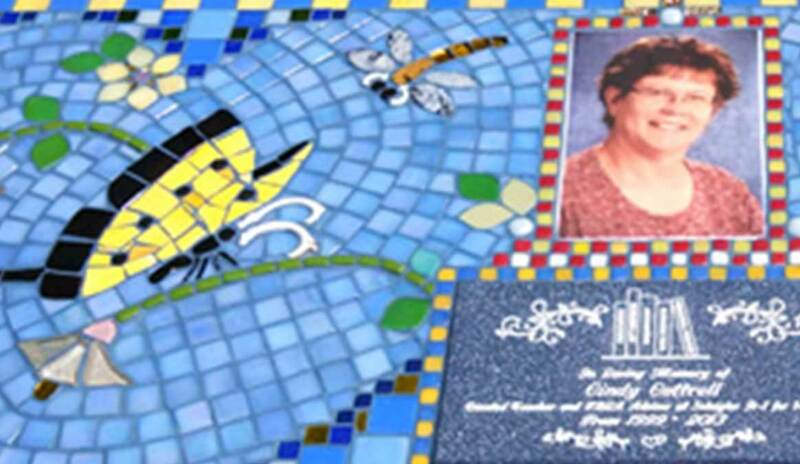 I could not think of a better way to keep her legacy alive at our school then to have such a beautiful memorial celebrate her two greatest passions: her family and her profession. Thank you, THANK YOU!!" 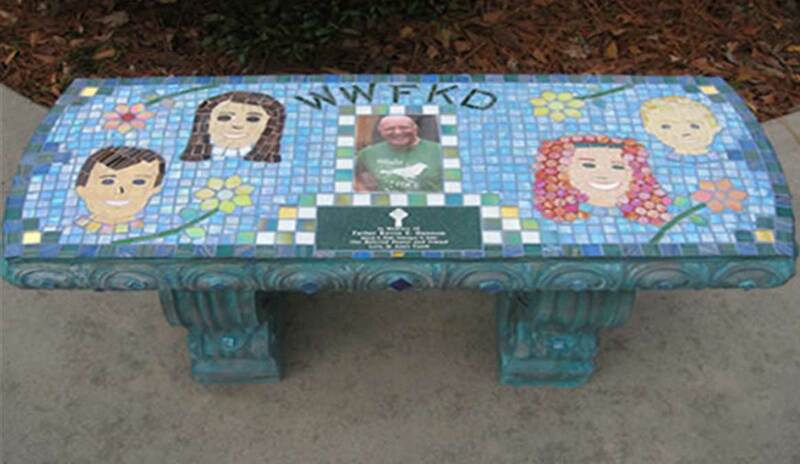 Custom designed bench and portrait tile in honor of Father Kevin surrounded by the children who loved him. 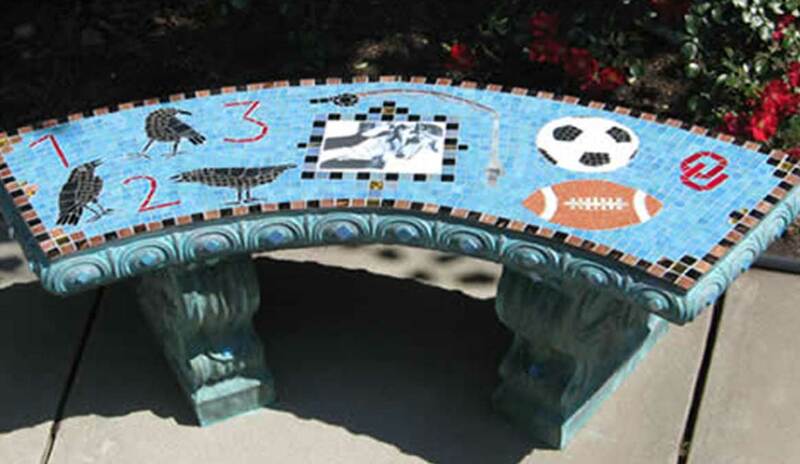 40 inch mosaic memorial art bench in patina blue. 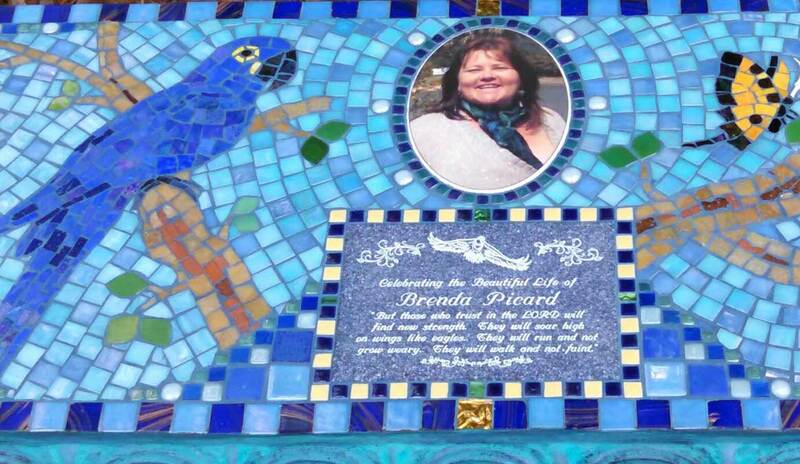 "Linda, It is gorgeous and so perfect. David and I just stood in amazement at what a perfect representation it was of Hannah and the things she loved. 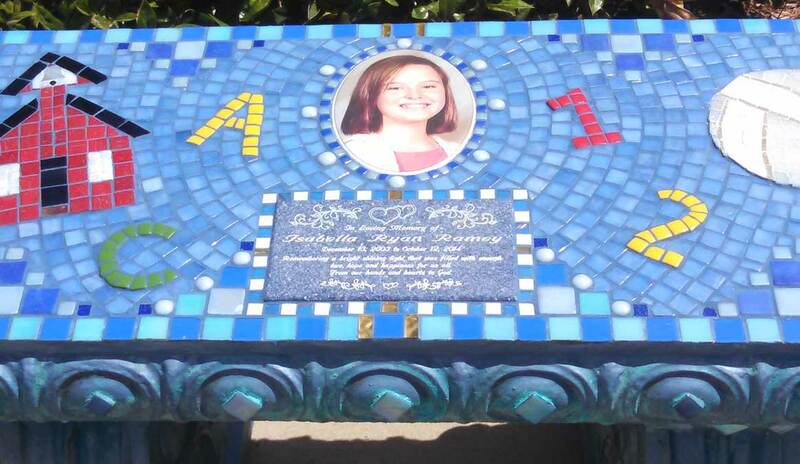 It means so much to us to know that she’ll always be part of the place she loved so much. Thank you seems like such an inadequate response but….THANK YOU!" 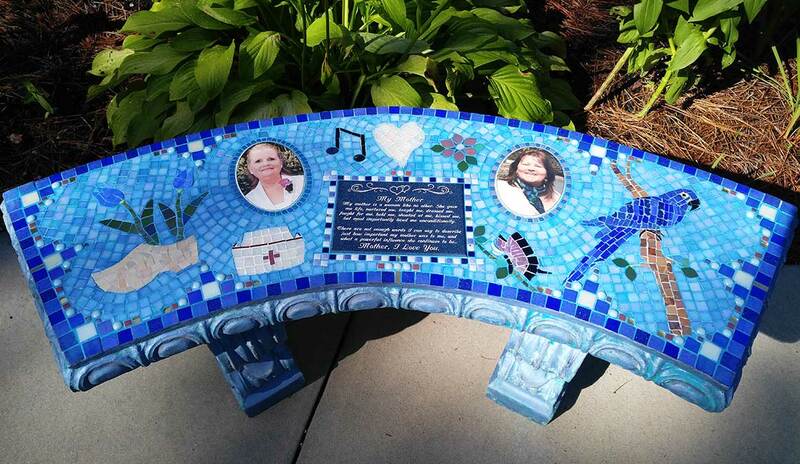 "The bench has arrived and it is perfect!!! I truly love it. Brought tears to my eyes. It represents Cindy so perfectly. Thank you for doing such an amazing job!!! I enjoyed working with you. From the bottom of my heart – thank you again!" 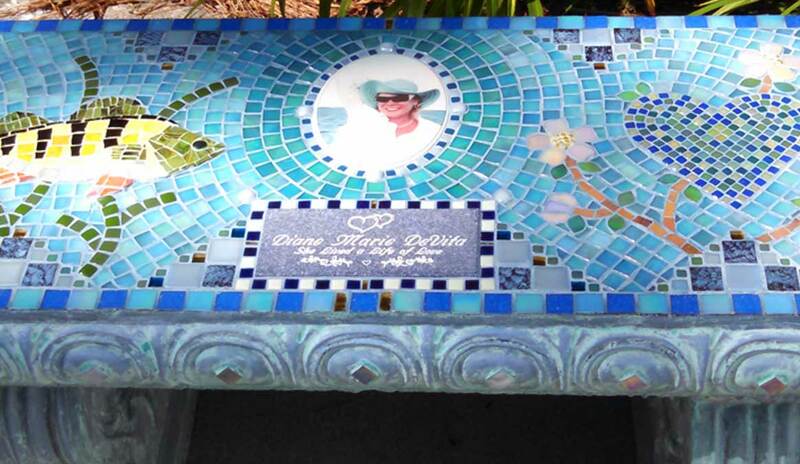 Custom designed 40 inch bench with a portrait tile. 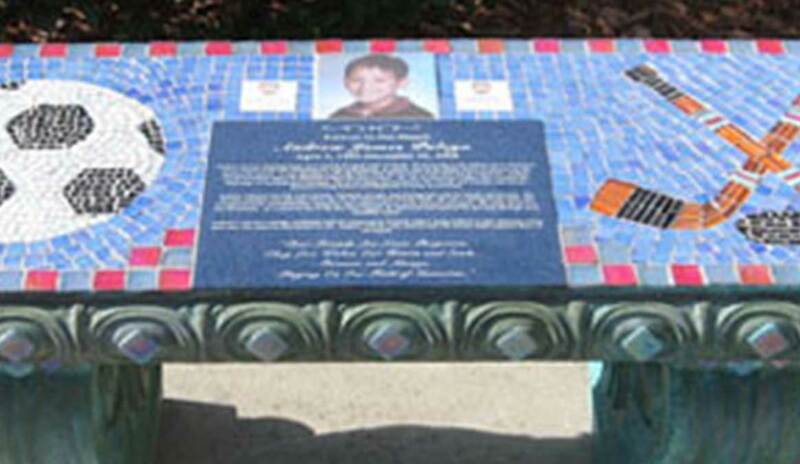 "I have to tell you how moved and awed I was when I first saw the bench. What an absolutely beautiful piece of art. And what a beautiful symbol of our son’s spirit, athleticism and character. I love how the different iridescent glass pieces sparkle in the sunlight. 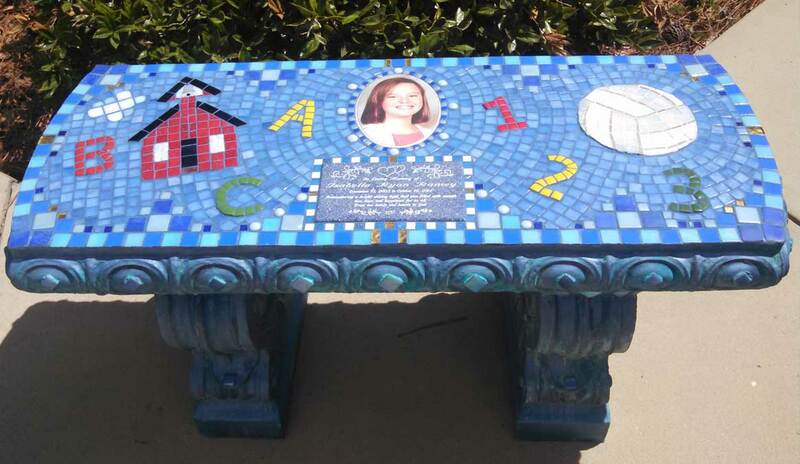 Thank you for putting your heart into the bench; it’s obvious that you love what you do.”“The bench will be a beautiful place for the kids at school to visit to remember and reflect on their friend Andrew. You have brought smiles to my family and the many kids, teaches and staff at Stratford who are continuing to cope with the loss of such a wonderful friend and human being. We will enjoy the bench always." 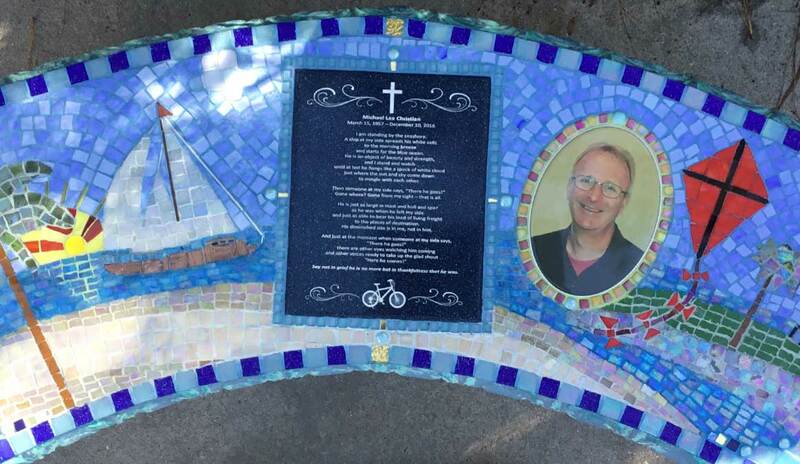 "I had seen pictures of Andrew’s bench earlier, but it was a breathtaking sight when they did the unveiling. 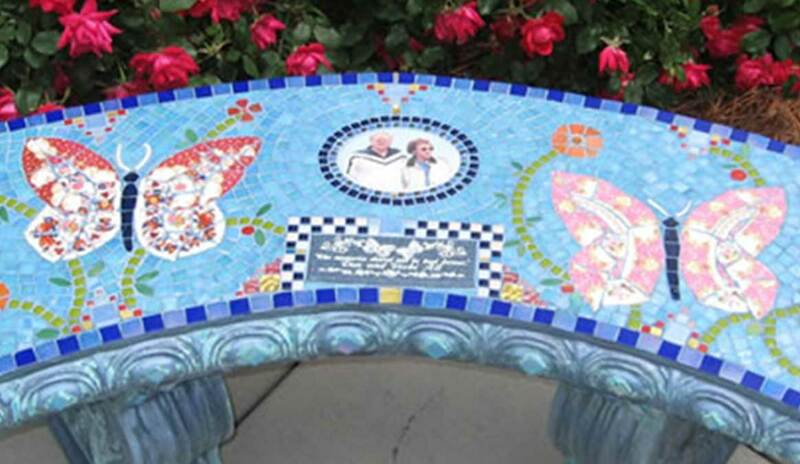 I didn’t realize how small the mosaic pieces were and how much work it took to lay each one. The sun was shining on it, and it just glistened. It is really amazing. 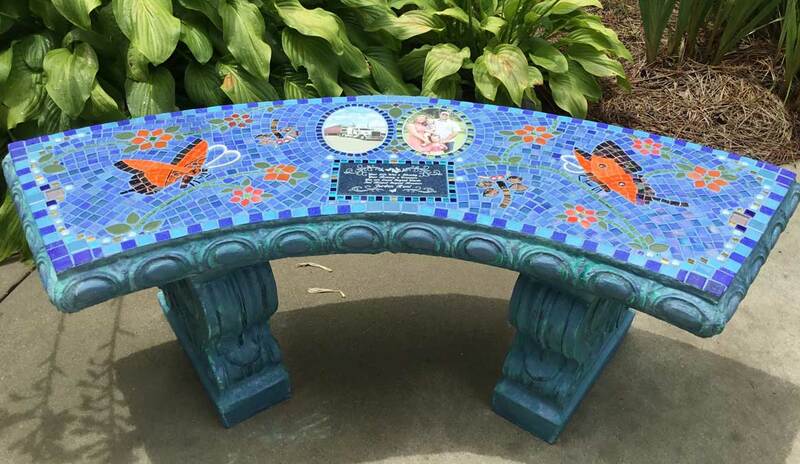 When they uncovered the bench all the kids said ‘AHHHHHH…..’Unanimously, people were overwhelmed at how beautiful it turned out. You are so talented and customer oriented. You take the time to create exactly what the family wants. 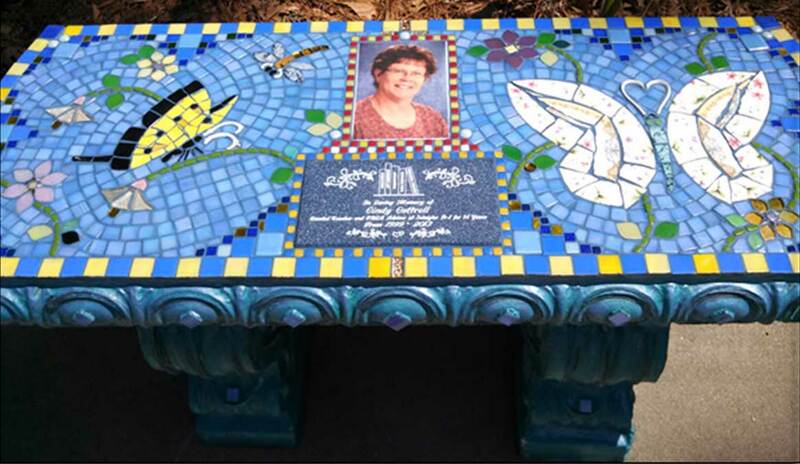 Thank you for sharing your talent to create something so beautiful for others."